Petro Poroshenko, a flexible politician and diplomat, is unlikely to focus on just one line of behavior. It won’t be a surprise if the utterly pro-American politician Poroshenko turns into a no less enthusiastic pro-Russian politician, come a change of mood in the world. 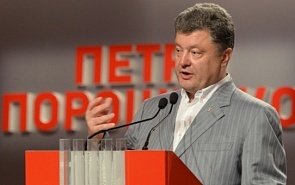 Petro Poroshenko, for all the elusiveness of his nature, is the choice of the Ukrainian people. The Americans didn’t grow him in their political incubator; they just put a bet on the most likely winner and did so rather late – approximately in March 2014. The earlier favorites were people like Arseny Yatsenyuk and Vitaly Klichko. Statements made by US politicians did not have much influence on Ukrainian voters. More likely, the electorate was swayed by technologies invented by a Ukrainian spin doctor, Igor Gryniv (who was behind the electoral success of Viktor Yushchenko and still earlier planned the establishment of the Reforms and Order and Our Ukraine parties). First of all, he cleaned out the minds of Ukrainian voters and made them accept Poroshenko as a “new politician.” Next he began publishing his growing ratings and convinced the public that his client took the lead in the race. All that remained was to give voters a motivation for support and urge a first-round vote. Poroshenko will have to create a new system of checks and balances, taking into account, among other things, the interests of eastern Ukraine with its major industrial facilities. Symptomatically, he has postponed the signing of the economic part of the EU association agreement. I think we may expect other gestures pointing to the ambivalence of his course for European integration. For Europe, Poroshenko will be as unpredictable a leader as Lukashenko is for Russia: he seems to be a “friend” and yet is permanently obstinate and inconsistent because of his preoccupation with economic gain. The fact that Poroshenko is in a hurry to “complete the antiterrorist operation as soon as possible, within days” bespeaks the main point: he will seek to leave the strong-arm tactics under the belt of the acting head of state, Alexander Turchinov. After his inauguration he will try to suggest a new peace plan to settle the “Eastern question.” It doesn’t look like he will continue the senseless and ruthless antiterrorist operation that is taking a heavy toll of both military and civilian lives. This will never settle the conflict. What would help bring peace and calm in Ukraine is an initiative for a real roundtable discussion with real participants who can discuss the new political system and a modified Constitution. This should be followed by an invitation to politicians from eastern Ukraine to join the government, an amnesty for militants in the East, renunciation of strong-arm tactics, and a campaign of civil reconciliation in Ukraine. The two countries, Russia and Ukraine, can and must engage in a dialogue, because the weakening of a dialogue in an era of global battles for influence is fraught with unpredictable consequences for all sides. Russia is, and in the short term, will remain not only a crucial but also in some respects the only market for many Ukrainian goods. Ukraine is an important economic partner for the Russian Federation (their trade, for example, exceeding that of Russia and the US). It is economic expediency that will motivate the sides to talk to each other. What we are witnessing is not a conflict between Ukraine and Russia but a conflict between the US and the Russian Federation, where Ukraine is merely a battlefield. Ukraine’s coming into its own under these circumstances is difficult but possible, and normalizing relations with Russia will help it towards this goal.